March AD 80. In Rome the Emperor Titus has announced that there will be a hundred days of games to open his new Flavian amphitheatre (now known as the Colosseum). Suspecting that their friend Jonathan is not dead, as they had thought, Flavia, Nubia, and Lupus organize an invitation to Rome on the pretext of witnessing this historic event. Their search for Jonathan leads them straight to the games, where they must face wild beasts, criminals, conspirators, and gladiators. It's Nubia's turn to employ all her courage and talents, and before the end of the story she is called upon to make the most terrible choice. A heart-pounding behind-the-scenes account of gladiator fights, executions, and beast fights makes this one of the most exciting Roman Mysteries yet. 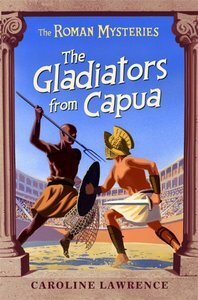 About "The Gladiators From Capua (#08 in Roman Mysteries Series)"